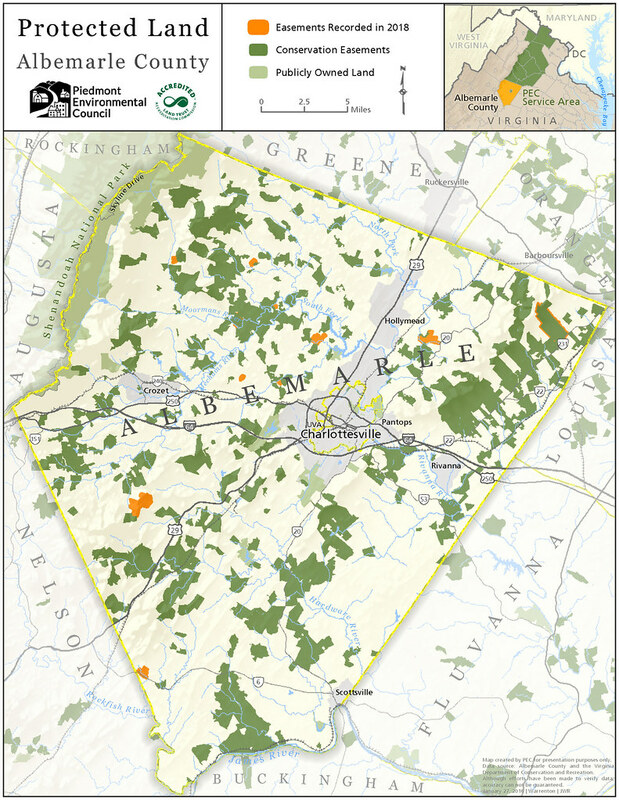 Only the second locality in the state to reach such a milestone, Albemarle County surpassed 100,000 acres of land permanently protected by conservation easements! In 2018, an additional 1,055 acres were protected in the county, bringing the grand total to 100,629 acres. Albemarle County Board of Supervisor member, Ann Mallek, is a part of one such family who made land conservation a priority. Over the years, Ann and other members of the Albemarle County Board of Supervisors have been instrumental to the county’s land conservation success through their support of the Acquisition of Conservation Easement Program. The program began in 2000, and it has protected approximately 10,000 acres by providing a financially attractive way for lower income landowners to protect family farms. Additionally, the county created the Albemarle Conservation Easement Authority, which holds a significant number of both donated and purchased conservation easements in the area. “One of the key factors behind the conservation in Albemarle is the strong desire of rural landowners to protect the countryside and the collaborative effort of various organizations working in the region,” says Rex Linville, field representative for PEC. In 2015, Fauquier County was the first in the Commonwealth to reach 100,000 conserved acres. The success in Albemarle and Fauquier, and throughout Virginia, is driven by exceptional tax benefits for conservation easement donors, along with available local, state and federal funding for landowners who are not in a financial position to protect their land with a donation. “If a landowner is interested in conservation, it is likely that there is a program to help them preserve their land,” says Rex. 41,188 acres in historic districts. This article was featured in our Spring 2019 Member Newsletter, The Piedmont View. You can read more of the articles on our website or view a PDF of the issue.